George Enescu (born on the 19 th of August 1881 – Varnav, Botosani, Romania – deceased on the 4th of May 1955 – Paris, France) is considered to be Romania’s visiting card, for as much as regardless of nationality, every pianist has heard at least once of the great Romanian composer, violinist, pianist, and bandmaster. Ever since his childhood his vocation was established, being the only child, from the eight of their parents Costache and Maria Enescu, who beat death. At the age of only 7 he started studying at the Conservatory in Vienne, and despite his early age he succeeds to amaze the audience beyond the border. After six years of study and musical activity in Vienne, he continues his studies at the Parisian Conservatory for five years. In 1898 he starts his career as a composer with the Symphonic Suite “Poema Romana” at the Colonne Concerts in Paris. At the age of 17, he starts to perform recitals of violin in Bucharest, and offer violin meditations. Beloved by the royal family and especially by Queen Elisabeta of Romania, he is invited numerous times to perform concerts at Sinaia in the Peles Castle. The compositions that made him famous, such as “Romanian Rhapsodies, Symphony, Suite no. 1 for orchestra”, “Seven Songs on lyrics by Clement Marot”, date from the first decade of the XXth century. Even though he initiates tournaments all over the world, the centre of his musical activity is on the Bucharest and Parisian stages. George Enescu is the one who precents for the first time in general audition on the Romanian stages “The IXth Symphony” of Beethoven, but also his own compositions. He was considered the spiritual father of music for those whose first steps were guided in the music world. The years of 1923 and 1938 remained in the collective international memory as the period of affirmation in the USA, performing concerts in Philadelphia and New York. Yehudi Menuhin, one of Enescu’s novices, was affirming about his master that for him “he’ll always stay as one of the genuine wonders of the world (…) His powerful roots and the nobility of his soul are coming from his own country, a country of an unequalled beauty”. He works at the monumental opera “Oedip” for ten years, between 1921 and 1931, work he dedicates to Maria Tescan Rosseti, who he had a beautiful love story with. The story of the two is the perfect symbol of love beyond any prejudice. As bridesmaid of Queen Maria, the young Rosseti, because of the deceptions she had for marrying Mihail G. Cantacuzino, and due to an innocent passion she had for the philosopher Nae Ionescu, takes extreme action in pouring acid on her face. In the extreme period that followed, George Enescu was the one who watched her every breath. Although Maria Rosseti remained physically disfigured for life, being forced to wear a veil on her face her entire life, between the two of them was bound a strong feeling of love which leads to their marriage in 1937. Even though he shared his entire activity between France and Romania, along with the start of the Second World War, Enescu donated the sum of 100.000 lei to the Ministers Council in Romania. This gesture reflects his strong feeling of patriotism which he felt for his country, country he could no longer visit once the communist regime was established. He spent his last years of life in Paris, where he was also buried. Because of his unmistakable talent he became official member of the Romanian Academy in 1932. The George Enescu Festival takes place every year, his masterpieces being performed. 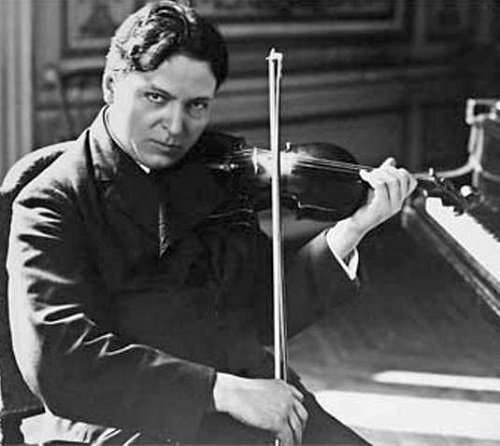 Through his ample artistic activity, George Enescu became an exponent of classic music for the entire world.